Are you a big fan of Timeless? Deadline reports the California Film Commission has praised the cancelled NBC TV show. As reported earlier, NBC has ordered a TV movie to wrap up the time-travel drama. The cast includes Matt Lanter, Abigail Spencer, Malcolm Barrett, Goran Višnjić, Paterson Joseph, Sakina Jaffrey, and Claudia Doumit. 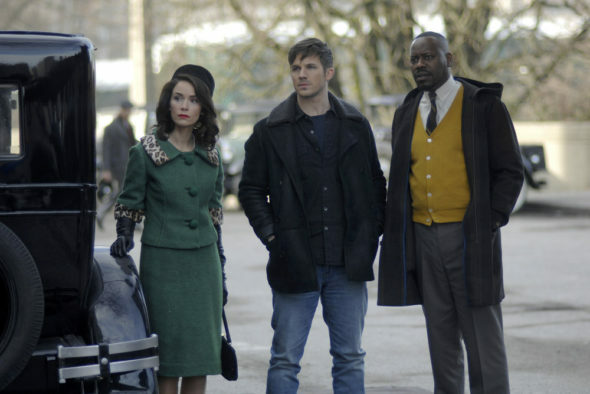 Fans of Timeless will know the NBC series was first cancelled then immediately uncanceled and brought back for a second season last year. For season two, the show moved production from Vancouver to California after receiving a large tax incentive. Now, even though Timeless has once again been cancelled, the California Film Commission has mentioned the show in their latest report as an example of their incentive program’s success. Of course, Timeless isn’t over yet. The series will air a special, two-hour finale on December 20th at 8 p.m. ET/PT. What do you think? Do you watch Timeless? Would you have watched a third season? It was a good show. I would’ve watched another 3rd, 4th season of the show easy. I would definitely watch more than 3 seasons of Timeless. Timeless was my favorite show onTV. I watched it every week. It told stories that were exciting, entertaining and taught us about history. Timeless had characters that you enjoyed seeing and that were well portrayed by the actors. It was a don’t miss program. I would follow it to any network or streaming service that will give it additional seasons. I loved Timeless and also considered it must watch TV. Very original, informative…made you want to read more about history they portrayed. YES YES YES AND I WANT A THIRD FOURTH FIFTH AND ON AND ON SERIES. I love everything about Timeless me the actors to the inclusivity. I’ve never liked history but Timeless made me love it. It makes it more fun and interesting to learn new things and it easily became my favorite show not long after it started. It makes me so sad that it got cancelled yet again. I’m hoping so badly that another network or Hulu or Netflix could pick it up. The fans are very passionate about it and I feel like if we were able to make it uncancelled the first time around then we can again. Fingers crossed!